Welcome to Garden Bloggers' Bloom Day for January 2016. Here in my USDA Hardiness Zone 6a garden in central Indiana, the question of whether we would get through the whole winter with no snow or ice has been answered, rather emphatically. Mother Nature recently slapped us with cold and punched us with some snow and now it appears winter is here and will be here for days on end. But like a bully who eases up for just a bit to catch his breath, Mother Nature did provide a bit of a warm up today, sending temps back above freezing. Tomorrow, though, the temps are forecasted to drop again and thus begins the roller coaster called winter. 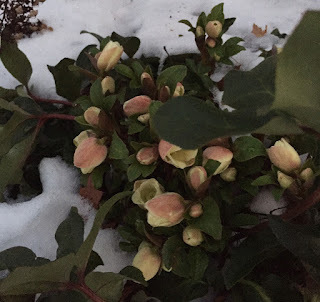 I dashed outside in the fading light of day and took a picture of what I think is Helleborus × ballardiae ‘HGC Cinnamon Snow', one of the Christmas's roses. I do like the hints of pink. I also found one snowdrop, the bud tightly closed, and took a quick look at the Camellias. I won't know until spring if they were harmed by this cold spell or the future cold spells sure to come. We gardeners are never without flowers, are we? And where we have true winter, most of us keep indoor flowering plants, too. Indoors, my Lily of the Valley, Convallaria majalis, is blooming. I first purchased pre-chilled pips for Lily of the Valley a few years ago, and have treated myself to a dozen of them every year since. The pips are quick to grow and provide a nice reminder of spring with every sniff. 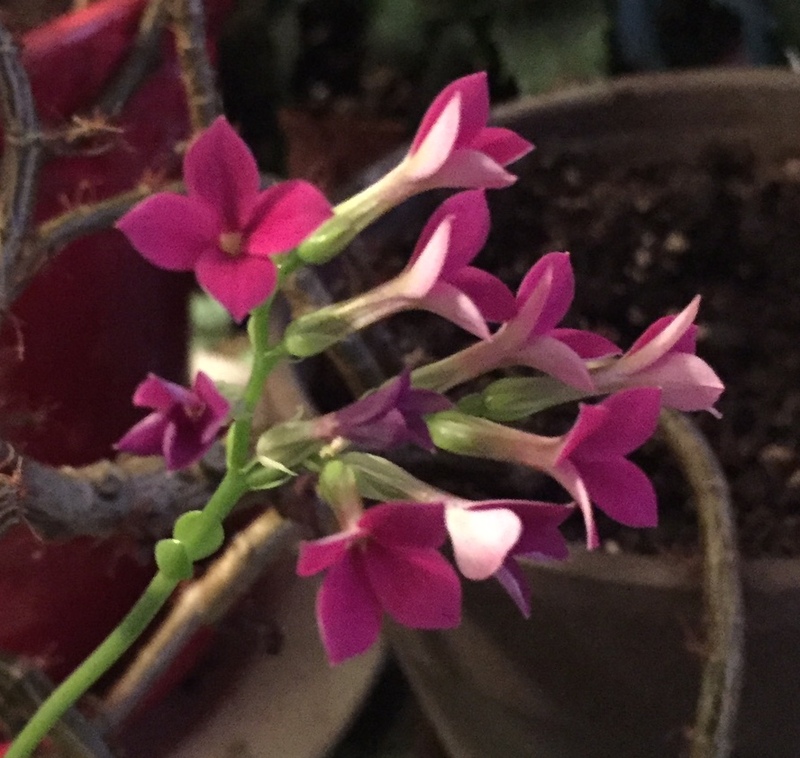 The Kalanchoe is also blooming. It grows a bit wild in the sunroom with long, light-seeking stems and no longer resembles the little tuft of leaves and blooms it was when I first got it, part of a foliage arrangement from my mother's funeral four years ago. I've half neglected it and yet it blooms. Another plant that blooms in my sunroom every single day, year round, is the Crown of Thorns, Euphorbia milii. I think the pink variety is the most commonly sold, but a few years ago, I found and purchased one with pale yellow blooms. I planted them in the same pot and there they happily grow. If you would like to grow a houseplant that will thrive even when neglected and always has some flowers on it, try Crown of Thorns. Just remember, it does have a lot thorns, so it isn't quite as huggable as some other plants. And that's what I have blooming on Garden Blogger's Bloom Day on this cold January day. Guess what? If you've been joining in for bloom day since the beginning way back in February 2007, you now have an astonishing nine years of bloom day records online. Yes, I had to count those years several times backwards and forwards to convince myself this meme has been going on for nine years. '07, '08, '09, '10, '11, '12, '13, '14, '15. Thank you to each and every blogger who has joined in whether from the very beginning or just last month. You all make bloom day fun and something I look forward to each month. Yes, I'm going to continue for the tenth year, starting in February. Until then, what blooms do you have in January? Are they all indoors? Or do you have blooms outdoors to show us? Indoors or outdoors, we'd love to see them. It's easy to join in. Just post on your blog about what's blooming in your garden and then come here and leave a comment to tell us what you have, and put a link to your post on the Mr. Linky widget so we know where to find you. I so enjoy and look forward to Bloom Day each month to see what is going on in other's gardens. I like the photos of your hellebores as they peek through the snow and cold. Our temperatures just started to drop here as well and winter has officially set in. As always thank you for hosting Carol! I guess GBBD is a much awaited big event every month for all garden bloggers. I forget many times to post because sometimes i forget the dates and i don't want to post at the end when nobody wants to see mine anymore, haha! But most of the time, yes, i link in. I just started blogging in 2008, so i am a year younger than BGGD. Thank you so much for hosting Carol, GBBD makes our blogging years a lot more fun. NINE YEARS? Fantastic! Congratulations on hosting this wonderful meme for so long! Such dedication. I am so grateful to you. I love your outdoor plants, and am heartened by your indoor ones. I am a hopeless with indoor plants. I think it's probably because I am outside so much. Whenever I am given an indoor plant, I look sadly upon it, knowing its likely fate. Stay warm in the bad weather. Winter has finally hit us here too. One day it was wonderfully sunny and surprisingly warm; the next, temperatures plummeted and it snowed all day long! You have some lovely winter flowers showing... hellebores are one of my favourites of all! I love your hellebore. A few years ago I stayed at the cottage where Helen Ballard developed her hellebores - it was one of the discoveries when we had the garden bloggers get together at Malvern. No indoor plants for me this month - it's a record breaking year for winter blooms in the garden this year. However, I think the forecast cold weather for this weekend will turn a lot of them to mush! A Happy New Year to you Carol! My first GBBD post was back in 2009 and your meme gives me much food for thought every month. Real winter weather has finally arrived here. That hellebore is most attractive - now if it only smelled like cinnamon that would be absolute perfection. My goodness Carol, nine years. Many congratulations and thanks for hosting GBBD every month. Yes, much colder weather here too now.. that hellebore is gorgeous! Happy Bloom Day. I am so glad you are continuing to host this meme. Even if I don't join in every time I love looking at the blooms from all over the world. Your lily of the valley is so pretty. I am closely watching your camelllia journey. I might give them a whirl at some point. Happy Bloom Day and Anniversary! I brought in my pot of Gerbera Daisies this Fall. They are still blooming! I love having the long lasting flowers in a vase in my kitchen. Blooms in Chicago in January? Well...not so much. So I'm coloring instead. Stop by my blog and check out this craze. Nine years, that is amazing! We have flowers in the conservatory but my post is about the flowers in the garden at the moment. A cold spell has arrived so I hope my flowers will be ok! Wow, 10th year! Many congratulations. In the meantime, I see snow in your top picture. Nice to have a reminder what it looks like, as up to now many of our UK gardens have thought it was spring, including mine. Love the idea of growing lily of the valley indoors - ridiculously I've never thought of that. Definitely one for next year. Thank you so much for hosting for nine years, Carol! Although I've only been blogging and participating for four of those years, I look forward to GBBD every month. I thought of you just yesterday while I was shopping and saw Lily of the Valley pips for sale. WWCD? What Would Carol Do? Looking forward to experiencing that fragrance before spring. Thanks for the inspiration. Thank you for hosting GBBD. I'm so enjoying seeing everyone else's less muddy, more bloom-y gardens. I'm sorry to hear about the snow. I hope your Camellias aren't damaged by the cold - mine seems to hang onto their buds and wait out the cold but then we don't get temperatures nearly as low as yours. I love Bloom Day and appreciate your hosting the event for 10 years! This marks the 4th anniversary of my first Bloom Day post. I haven't missed a single month since I started blogging. "like a bully who eases up for just a bit to catch his breath"...so well said! Happy GBBD anniversary! Wow, nine years, Carol! Who would have thought this simple idea would travel so far and so long. A huge congrats to you... your baby is going to hit double figures in February... scary! Happy GBBD, it's always fun to join you here. It always catches me when I see your lily of the Valley indoors. Here, it Scotland it is regarded as unlucky to bring picked ones indoors. Perhaps growing them completely indoors changes that - they have been blog lucky for you. Nine years?!? Time sure flies. No real snow yet here in DC, but I am still yearning for spring in 40 (or so) days! I don't know what to think of the weather, here in upstate New York. We have a low of 5F above. Several days later, it's in the 40's. Rinse and repeat. My flowers are all indoors now but, for all I know, my hellebore (whose blossoms froze when it got down to 5) may have buds opening right now. I never had a chance to look. I've never tried lily of the valley indoors - but unlucky? Hmmm. I am so happy you are continuing GBBD another year, and look forward to GBBDs in 2016. I have been with you since 2011.... so that will make it 5 years in March! Thanks so much for the encouragement! My "Cold Hardy" camellias survived the first two winters just fine when the lowest lows were in the single digits. Then there were the two winters of the Polar Vortexes with negative lows down to about -4 or was it -8. And there was no snow cover. And there were howling winds. The "Cold Hardy" camellias all turned a crispy brown. The two oldest with the best root system were root hardy. One is coming back nicely. The other ... well, it has a few leaves and sprouts. My Euphorbia milii is neglected outside, and I never thought of bringing it indoors. I assumed it would need more sun. Thanks for the tip! Well, I neglected to go see what was blooming in my January garden, but I suspect not much. I did, however, notice that the pansies that had been blooming all winter, and hidden in the garage once real winter arrived, still have some droopy blooms on them. Does that count? What a wonderful idea. By a lucky coincidence I stumbled upon your blog today and immediately ran outside to try to find something in bloom so I could participate. Looking forward to coming back every month to see what everyone else has in their garden. My kalanchoes are also faring quite nicely -- unlike last year at this time, when a fellow GBBD blogger and I were wondering what we were or weren't doing that was keeping them from blooming. I guess a summer in the three-season room did mine good! I have missed a month here and there, but in general I have been with you from the beginning. I agree: that hellebore is Cinnamon Snow. I am rooting for your camellias. Here's to a new year, Carol. Thanks for hosting all of us. My Hellebores look about like yours - a while until they're open, I fear. I do have a wonderful Arctostaphylos, and I'm delighted to say that my Camellia sasanqua 'Yuletide' is coming back with blooms even after an ice event. Thank you for hosting! I guess it must have been years ago that I participated in this Blog meme. On Dutch and Flemish garden blogs, many bloggers participate in the 'Plant of the Month' meme, and I'm going to combine this with GBBD. For this month, I'm talking about Cyclamen coum. Only an introduction in English. If I see I get quite some English speaking visitors, I might consider translating my post in the next month, but for now it's only in Dutch. Only my second month of joining in but I'm enjoying already. Good discipline to photo on a particular day.So interesting to see yours and others, blooms. I've managed to join in though a little late! This has been such a wonderful meme :) I've never had the nerve to try forcing lily-of-the-valley, but it's a favorite scent and definitely won't grow outdoors here, so perhaps I should take a cue from you and try! Hope your hellebores and snowdrops are as sturdy as their reputations and come through nicely for warmer weather! I love that you're forcing lily of the valley! It really is much more appreciated in January than it is in May. I'm a little late but thanks for hosting again. Best.